Richard Urrizaga’s New Book “The Outlaw and The Pocket Watch” is a Creatively Crafted and Vividly Illustrated Journey into the Old West. Recent release “The Outlaw and The Pocket Watch” from Page Publishing author Richard Urrizaga is both captivating and cultural; this work keeps the reader mesmerized through the twists and turns of a western love story. Richard Urrizaga, an adventurer, outdoors enthusiast, story-teller, devoted writer and author, has completed his new book “The Outlaw and The Pocket Watch”: a gripping and potent journey of ranching, love, family and courage with several unexpected moments! Published by New York City-based Page Publishing, Richard Urrizaga’s entertaining work will keep the reader fascinated! 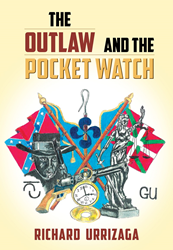 “The Outlaw and the Pocket Watch”, is a story of a Basque immigrant's adventures in America. Escaping the tyranny of the Spanish Government, he takes on a sheepherding contract in the mountains of Nevada and eventually brings his bride from Spain to raise a family by ranching sheep. Despite starting from nothing, and the always-present prejudice that existed between the cattleman and the sheep industry of the times, through Basque determination, he flourishes. It is a story of a young man coming of age, his first love and the concerns by both sets of parents, greater now, because the boy's family is in the sheep industry and the girl's in the cattle business. It is a story of an old Missourian outlaw, scared and callused by war, who years before, because of mistaken identity, was given another chance. It becomes his life quest to "set-the-scales-right." The characters are as varied as the nocturnal inhabitants of the Nevada desert and are as colorful as a sunset on the Great Basin. The story has more twists than the root system of a Bristlecone Pine. Far from the formulaic "quickest-gun-in-the-west" tale, “The Outlaw and the Pocket Watch” is a portrait of hard working and hard-fighting pioneers by a man who has lived in the hills. Readers who wish to experience this profound work can purchase “The Outlaw and The Pocket Watch” at bookstores everywhere, or online at the Apple iTunes store, Amazon, Google Play or Barnes and Noble.